In November 2011, a rock-hewn burial cave was documented near Horbat ʽAtrabba (Permit No. A-7292/2014-06; map ref. 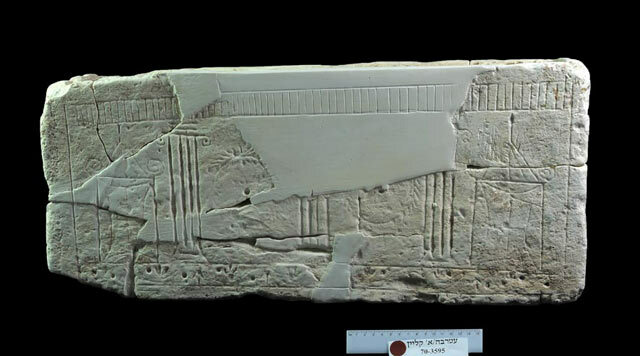 189665/622787), as part of the ongoing supervision by inspectors of the Unit for the Prevention of Antiquities Robbery. 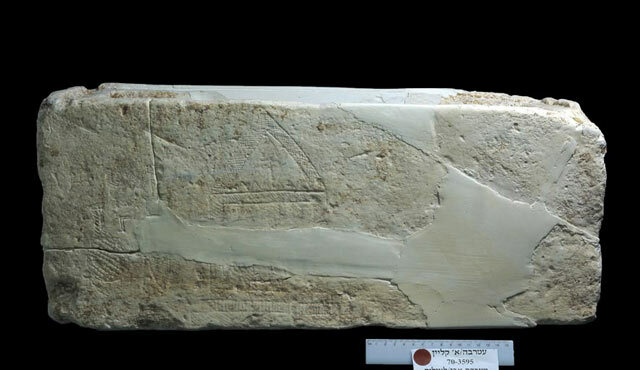 The documentation, on behalf of the Israel Antiquities Authority, was carried out by E. Klein and A. Klein (field photography and drafting), with the assistance of C. Amit (studio photography), O. Raviv (stone restoration) and I. Lidsky-Reznikov (drawing of finds). Horbat ʽAtrabba is in the Judean Shephelah, on a hilltop rising 210 m asl south of the Nahal Ha-Ela streambed, c. 4 km west of Tel ʽAzeqa and c. 4 km east of Tel Zafit. No archaeological excavation has been conducted at the site to date; however, a hiding refuge was previously documented at the top of the ruin, possibly from the time of the Second Temple or the Bar Kokhba Revolt, which was hewn around a stepped water cistern with a spiral staircase that predates the hiding phase (Frumkin 1986). In the past, it was suggested that the site be identified with Kefar Tov, which appears on the list of Vespasian’s conquests in the land of Edom during the Great Revolt (Josephus, The Wars of the Jews IV, 447; Abel 1924), and Torban, where a Byzantine monastery was constructed in the fifth century CE (Sozomenos, Historia Ecclesiastica, IX, 17, 1). The burial cave is situated on the lower part of a spur in the southern part of Horbat ʽAtrabba (Fig. 1). The cave, which was hewn along an east–west axis, was breached in the past by antiquities robbers, who plundered its contents. The courtyard or entrance of the cave is today covered with soil and the cave can only be accessed by means of a shaft (depth 3.5 m) that was dug by the robbers near its bedrock facade (width and height of the cave’s opening 0.6 m). The opening leads to the burial chamber by way of a hewn step (height 0.5 m). The main burial chamber is rectangular (2.6 × 2.8 m) and a rectangular standing pit (length 1.8 m, width 1.5 m) in its center is partially covered with alluvium, which penetrated the opening of the cave, thus making impossible an accurate reconstruction of the depth of the standing pit. A rock-hewn bench (width c. 0.5–0.6 m) flanked the perimeter of the pit on three sides of the burial chamber (northern, southern and western). There were three loculi (average length 1.8 m, width 0.4 m, height 0.8 m) in each of the walls and their arched openings had a rectangular frame carved around them into which closing slabs were inserted (Fig. 2). 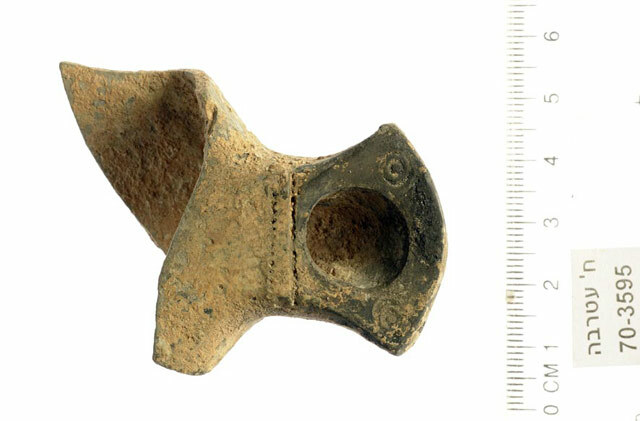 Fragments of three limestone ossuaries were found in the center of the cave alongside a fragment of a nozzle belonging to a knife-pared lamp typical of the first century CE (Barag and Hershkovitz 1994:50, Fig. 3), decorated with two rouletted stripes and two stamped impressions of concentric circles. One of the ossuaries was not decorated; it was found shattered in many fragments that were left in the cave. A fragment of the front of the second ossuary (length 0.4 m, height 0.18 m; Fig. 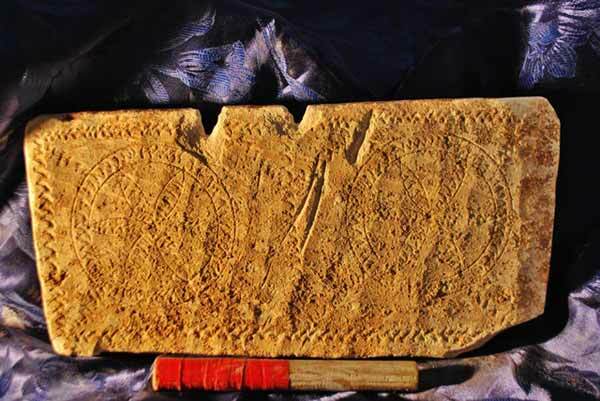 4) was adorned with typical decorations of two six-petalled compass-made rosettes set in circles and surrounded by a frame in a zigzag pattern. The third ossuary was embellished with rare decorations; most of its fragments were gathered for restoration (outer dimensions: length 0.64 m, width 0.31 m, height 0.25–0.29 m; Fig. 5; the decorations will be discussed in a separate article). 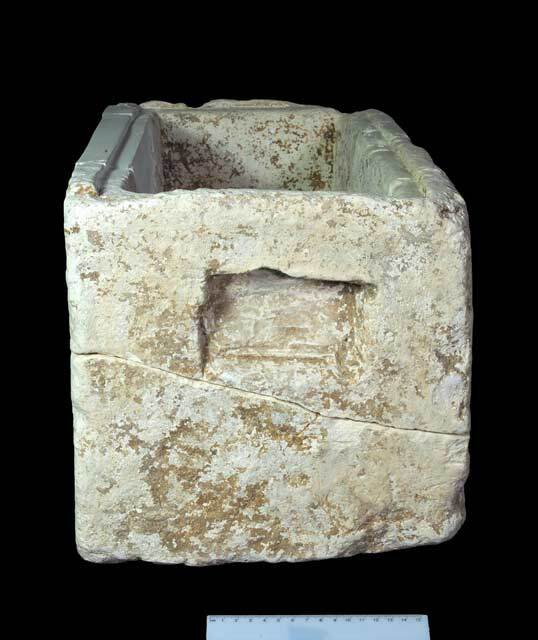 That ossuary was very crude and asymmetric (bottom thickness of the wall 8–9 cm, top thickness of the wall 4–5 cm). Two indentations chiseled in the center of the narrow walls were used for holding and lifting the ossuary (Fig. 6). A ledge that accommodated the lid was hewn around the opening of the ossuary. The decorations on the ossuary are schematic and haphazard but the motifs appearing on them are taken from the world of Roman art and the Jewish burial customs of the period. A large group of ossuaries belonging to this type, without decorations, was discovered in the excavations of a burial cave at Horbat Zefiyya, c. 2.5 km west of Horbat ʽAtrabba, and was dated to the period between the Jewish revolts against the Romans (70–135 CE; Nahshoni et al. 2002:66–68). Other crudely fashioned decorated ossuaries are also attributed to this period (Rahmani 1994:23–24, Nos. 199, 462, 463, 465, 473, 555, 635, 814, 825). 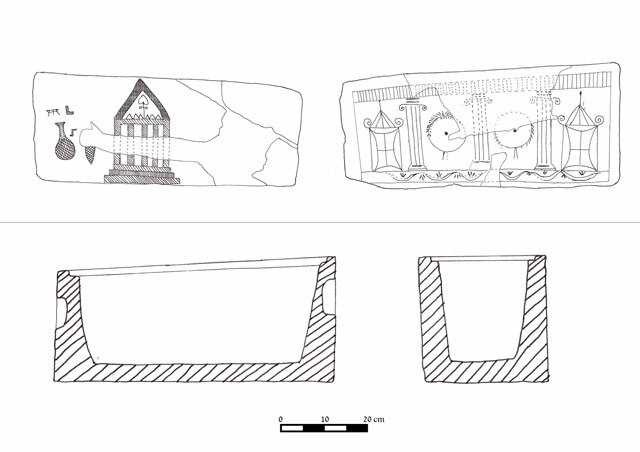 The architectural plan of the cave, which resembles that of the burial caves from the Second Temple period in the necropolis of Jerusalem (Kloner and Zissu 2003), and the ossuaries, indicate that the cave was used for burial by a Jewish family who lived in nearby Horbat ʽAtrabba. Although the cave had been plundered and was not excavated, and the artifacts that were recovered were minimal, an analysis of the finds enables us to date the burial cave to the time of the first century–first third of the second century CE. During this period, the Judean Shephelah was densely inhabited by a Jewish population (Zissu 2001). Barag D. and Hershkovitz M. 1994. Lamps from Masada. In J. Aviram, G. Foerster and E. Netzer eds. Masada IV: The Yigael Yadin Excavations 1963–1965, Final Reports. Jerusalem. Pp. 1–147. Frumkin A. 1986. A Hiding Refuge at Horbat ʽAtrabba. Niqrot Tsurim 11–12:46–49 (Hebrew). Nahshoni P., Zissu B., Sarig N., Ganor A., and Avganim A. 2002. 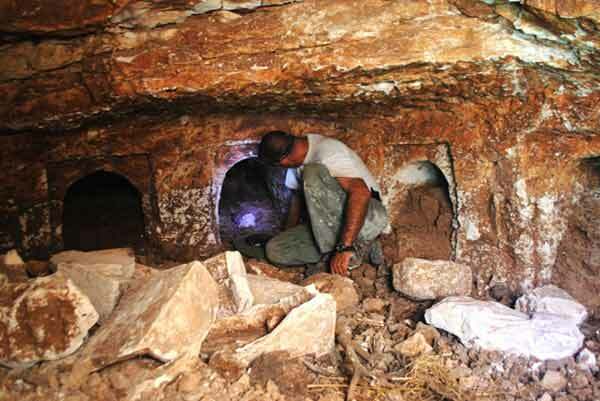 A Rock-Cut Burial Cave from the Second Temple Period at Horbat Zefiyya, Judean Shephelah. ‘Atiqot 43:49–71. Zissu B. 2001. Rural Settlement in the Judean Hills and Foothills from the Late Second Temple Period to the Bar Kokhba Revolt. Ph.D. diss. The Hebrew University of Jerusalem (Hebrew). 1. 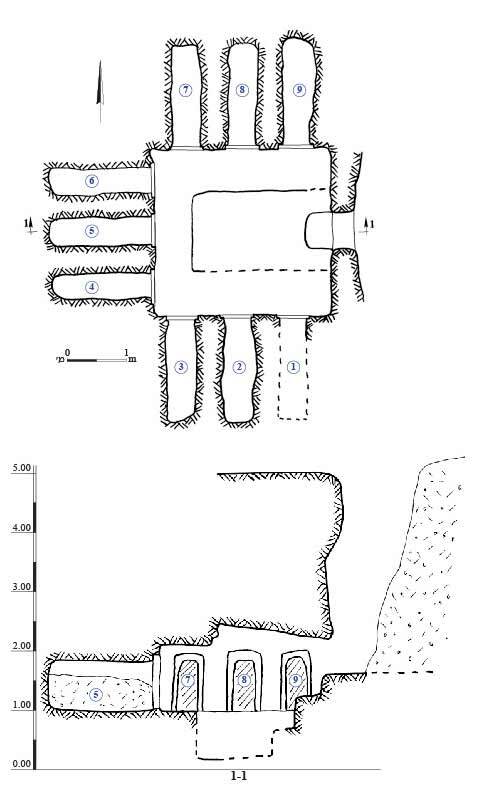 The burial cave, plan and section. 2. The burial chamber, ossuary fragments and framed loculi, looking east. 3. Fragment of a knife-pared lamp from the main burial chamber. 4. The front portion of the second ossuary decorated with two rosettes inscribed within circles. 5. Decorations on the third ossuary, facades and sections. 6. An indentation in the narrow side of the third ossuary, used to grasp the object. 7. Decorations on Facade 1 of the third ossuary. 8. Decorations on Facade 2 of the third ossuary.